Many of us may not be familiar with Japanese football, but will definitely remember Gaku Shibasaki, who scored a brace against Real Madrid in the Club World Cup final in 2016 and now, is playing for Getafe in La Liga. Some may think of Andrés Iniesta (former Barcelona captain), Lukas Podolski (former Arsenal striker) and Fernando Torres (former Atlético Madrid forward), who are currently the stars in the J. League. I’ll probably continue to talk about Iniesta, Podolski and Torres in a separated article. Yet in my opinion, I believe that Japanese football deserves more attention and support since it’s a display of the reason why football is called “the beautiful game”. We know that Japanese people are known as “hard-working folks” but they’re also dedicated to what they do. Having the “samurai spirit” inside them, they’ll do whatever they must in order to win in sports. The players are those people who’ll fight for the glory, the badge on their jerseys and their fans. It’s not just the J1 League clubs but football in the country in general. One of the Emperor Cup matches (similar to the FA Cup in England) this season displayed this kind of mentality. The football section of Kwansei Gakuin University beaten J1 League giants, Gamba Osaka, away in the dying minutes of extra time and fell short of Tokyo Verdy of just one goal in the third round. 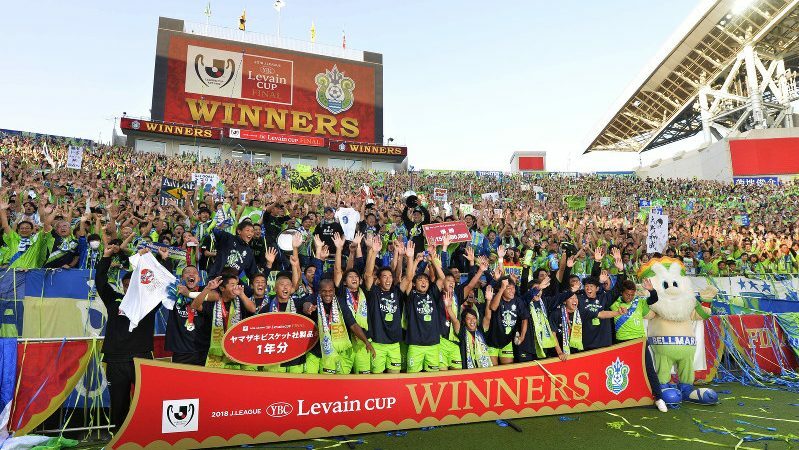 Not to mention that Shonan Bellmare defeated favourites Yokohama FM in the Japanese League Cup final to lift the trophy for the first time in their history, with Daiki Sugioka’s goal proving the difference. Sounds nothing new to you, right? However, the Japanese have an amazing attitude and believe that everything can happen. They fear no one and won’t give up until the end, which makes the fixtures intense, unpredictable and entertaining to watch. The supporters are also a reason why we should follow the J. League. Why? Because they’re loyal, passionate, polite, creative and supportive of their clubs, which reminds me of the fanbase of the German Bundesliga in Europe. I could still remember that when Eastern, the very first team from Hong Kong to participate in the AFC Champions League, visited Kawasaki Frontale, the home side thanked the visitors for their help when they were playing away. I know, this doesn’t give you the big picture of how the Japanese people behave. However, it’s always something worthwhile for us to understand the culture of a country through their sports. This is why by watching the J League, you don’t just watch football and it’s not just 90 minutes (for fans only, I guess). You also get to know more about Japanese people and their culture in the process. If you really want to follow a football league which anticipates interesting football, an excellent matchday atmosphere with the experience of seeing some celebs play in person, J. League may be the one for you. Yeah, the Premier League, Serie A, Bundesliga and La Liga are also entertaining. But watching the J. League may bring you a brand new experience to know football better as a sport. Who knows?